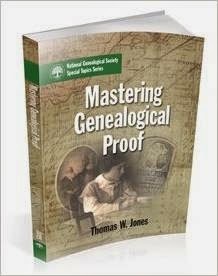 There are two new Gen Proof Study Groups forming to study the book Mastering Genealogical Proof by Thomas W. Jones. There is no charge to participate other than the cost of the book. The group mentors have all been through the book in their own mentoring group with Tom Jones. Shelley Bishop will mentor an Advanced group using Google+ Communities with a video chat (hangout) option. They will cover one chapter per week beginning September 1st. Solid intermediate participants are welcome in this group as well. Julie George will mentor a Beginner/Intermediate group using Google+ Community. This group will also cover one chapter each week and begins September 8th. answer questions and highlight certain concepts, and participants should check in daily also. If you have any questions, please email genproofstudy@gmail.com. BCG Announces New Webinar Series! Monday, September 22, Thomas W. Jones, Ph.D., CG, CGL, FASG, will present “Fine Wine in a New Bottle: Guidelines for Effective Research and Family Histories.” Updated, retitled, and reorganized, genealogy standards first published in 2000 are now available in a new edition. The webinar will describe the changes and what they mean for all family historians. Dr. Jones teaches at three genealogy institutes, co-edits the National Genealogical Society Quarterly, and is the author of Mastering Genealogical Proof. On Wednesday, October 15, Judy G. Russell, J.D., CG, CGL, will explain “Kinship Determination: From Generation to Generation.” Requirement 7 of the BCG certification application asks for a Kinship Determination Project in which the applicant writes a three-generation narrative and explains how the relationships are documented. All genealogists do this regularly while placing relatives with their appropriate connections in the family tree. A familiar speaker at conferences across the country, Judy will coordinate the Advanced Methodology & Evidence Analysis course at the Institute for Genealogy and Historical Research in 2015. To register for either of these webinars, or to watch for future presentations, see to the BCG blog. FOR IMMEDIATE RELEASE – Dallas, Texas – August 12, 2014 – Registration for the fourth annual Forensic Genealogy Institute (FGI) will open on September 9, 2014, at 1 pm EST. 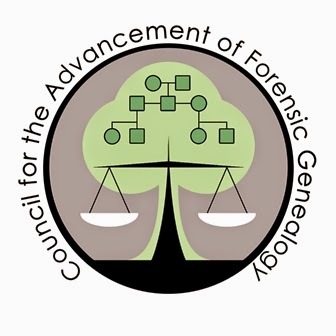 The educational arm of the Council for the Advancement of Forensic Genealogy (CAFG), FGI will be held March 26-28, 2015, at the Wyndham Love Field Hotel in Dallas, Texas. Registration for each course is $445, which includes 20 hours of instruction by expert forensic and genetic genealogists in just three days, minimizing travels costs and time away from family and work. Enrollment is limited, so early registration is encouraged. “In keeping with CAFG’s goals to promote and maintain high standards of professionalism, the fourth FGI enlarges and expands upon the curriculum offered at the previous institutes,” said Leslie Brinkley Lawson, CAFG President. “The 2015 program offers must-have education, training, mentoring, and professional development to those thinking of careers in forensic or genetic genealogy. The “Forensic Genealogy Master Practicum” provides hands-on experience in researching various types of forensic cases, working with clients (including interviews and contracts), writing forensic reports or affidavits (students will write three reports), and participating in or observing a mock trial to defend a forensic report. Enrollment is limited to 40 students. The “Advanced Genetic Genealogy and Unknown-Parentage Cases” course applies DNA and traditional genealogical research to uncovering the genetic heritage of individuals with unknown parentage. This area of forensic research is expanding rapidly, and genealogists who can use DNA to successfully address unknown-parentage cases are in great demand. Enrollment is limited to 60 students. For full details of each course’s curriculum, as well as faculty biographies, visit www.forensicgenealogists.org/institute. I was excited to see an announcement about another new genealogy institute on Facebook today. The first Genealogical Research Institute on the campus of Carl Sandburg College in Galesburg, Illinois will be held May 28th through June 1st in 2015.